The Core Program brought Jasper Wong, the founder of POW! WOW! — a non-profit organization of contemporary artists — to Occidental College Nov. 5. Wong was invited to further enhance the Cultural Studies Program (CSP) theme, Local Cities / Global Realities, according to former Core Director and current Associate Dean for Student Academic Affairs and cognitive science and philosophy professor Carolyn Brighouse. What ensued was a more complex and serious discussion of cultural appropriation and Native American representation. This latter dialogue was led by Kelsey Martin of the Indigenous Students Association, who asked Wong several questions at the conclusion of his lecture. According to its website, POW! WOW! is a network of artists that organizes art and music projects and holds festivals in cities around the world. “Jasper’s work appealed to us. 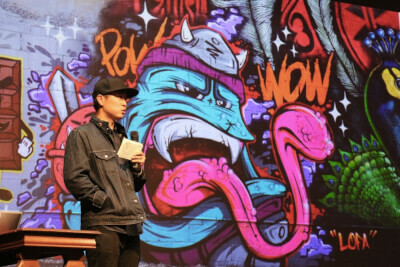 He has venues outside of the traditional elite art museum, and he brings street artists together from across the world,” Brighouse said. The Core Program invited the student body and broader Occidental community to Wong’s Lecture via schoolwide email Oct. 26. This title references the Native American Powwow, which Dennis Zotigh, an American Indian research historian who belongs to the Kiowa, Santee Dakota and San Juan Pueblo tribes, defines in his paper “Moving History: The Evolution Of The Powwow.” Zotigh defines the Powwow as a tradition of social gathering that has hundreds of different interpretations varying greatly throughout history and from tribe to tribe. In his lecture, Wong explained that he has received repeated criticism from Native Americans concerning the name of his organization, many of whom told him that they worry people will attend his event and think it is a traditional Native American Powwow. In response to these concerns, Wong added exclamation points to divide the name, creating the logo that now appears on merchandise. Wong said he uses his website to clarify that his organization and the Native American tradition are different. The website contains a page for information about traditional Powwows. The About tab states “Together [the words] form POW WOW, which is a Native American term that describes a gathering that celebrates culture, music and art.” He did not clarify how his festival and the Native American tradition are different. Wong used this same definition of Powwow during the lecture, a definition that Martin said lacks context. During the discussion period after the lecture, Martin expressed worry this lecture may have been the first time that first years were exposed to Native American terminology in general. She was particularly concerned that this initial exposure was provided by a person who is not of indigenous heritage. “When I originally named it, I was young. I was ignorant, and I didn’t see it beyond what I liked about the name,” Wong responded. According to Ina Morton (first year), pleading ignorance is unacceptable. “He seemed to absolve himself of anything wrong that he even acknowledged that he did, but he was able to just wipe it off using typical defensive tactics — ‘I was young, I didn’t intend it’ — and then really just didn’t say that he was going to make any amends either,” Morton said. Brighouse said that Wong’s visit may have been an oversight, but she was glad that students felt empowered to challenge Wong and his semantic decisions. According to Martin, she would love for this to lead to a longer conversation about what it means to bring indigenous names and words into a space without indigenous representation. “When I first arrived at Oxy, I knew one other indigenous student … I desperately wanted to see more representation of people like me on campus, on the very stage you [Wong] are standing on, in fact,” Martin said during the lecture discussion. While this article uses the spelling Powwow, there are many different spellings.